Photo: "Subway Commute" by blogTO Flickr pooler Proliphic. The TTC has a new boss. After paying a headhunting firm to search the world for candidates to interview, they ending up going with a veteran insider. The CN Tower will be lit up like candy tonight, in the official ceremony marking it's new flare. So far the change has been very well received. Ryerson University wants Sam's, and if the outgoing owner doesn't want to deal, Ryerson is willing to ask the province to expropriate the building. Let the hardball for prime real estate begin! Lakeview Generating Station in Mississauga has been scheduled for demolition, but continues to be spared by the weather. By the time you read this it might be rubble, or it could once again live to se another day. Neighbours of the provincial minister of the environment filed a complaint to the OMB in attempts to stop her household from building a 4-car garage for the family's hybrid, SUV, and two sports cars. Stories like this reinforce my fears that we're totally screwed. Our kids are schlubs. A recent report gives Canadian children a failing grade for fitness, and encourages parents and kids to get active. Yesterday's blogTO Crossroads puzzle was the first to go unsolved in over 50 puzzles! It's High Park Ave (just north of Bloor). 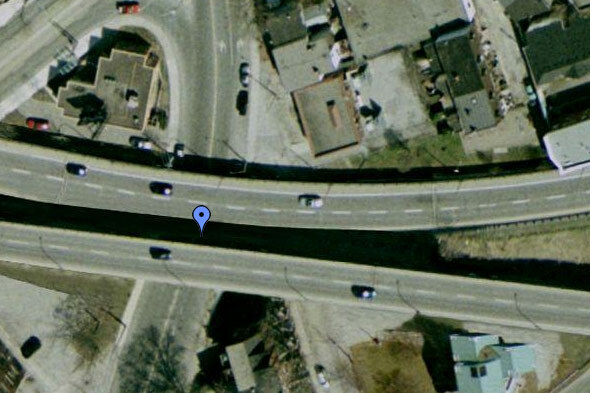 Yesterday's answer: High Park Ave (just north of Bloor).